Female kōkako build strong nests. They form a base structure of twigs, then weave a deep cup using long fibrous material and vine stems. The cup is then lined with soft material such as moss or rotten wood. 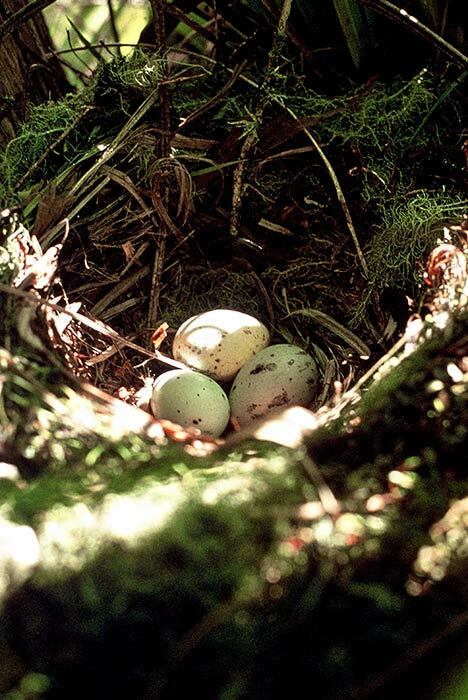 The North Island kōkako female lays two or three pale pink eggs with dark mauve blotches. She incubates them while the male brings her food. Some years, if food is plentiful, she may lay two or even three clutches. What is the difference between the north and south kokako besides the wattles?